All transactions are safe and secure with a reliable history in online purchasing behind each of our associates. Buy the Borat Mankini Swimsuit Costume to own Borat clothing and merchandise. 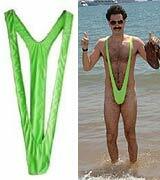 This officially licensed Borat swimsuit costume mankini will capture the attention of everyone at the party. The attractive green thong looks great with a Borat hat or as a stand alone item. The unique piece of clothing is evidence to how Borat (Sacha Baron Cohen) picks up women in his native country of Kazakhstan. He simply says, "Very nice. How much?" Wear this Borat costume swimsuit under an officially licensed Borat tee. In addition to the Borat Mankini Swimsuit Costume above, browse the Borat Clothing Gallery for more apparel like men's and women's clothes, kids shirts or hoodies.